A yellow-bellied marmot can’t predict the weather. Its cousin, the groundhog, can’t either. Every Candlemas, local news stations across the Anglo-American world will be covering a bizarre ritual. At the local zoo or wildlife center, some people with super-thick gloves will be annoying the resident marmot this morning. In my part of the world, it will be French Creek Freddie, a groundhog, who will be roused from his deep hibernation. He will be taken out into the broad daylight. And somehow, it will be determined if he saw his shadow or not, and if he sees his shadow, then we’re in for six more weeks of winter. The big ritual happens at Punxsutawney, Pennsylvania, and it is supposedly based upon an German custom of annoying a badger or hedgehog on Candlemas for the same purpose. Neither species is found in Pennsylvania, although wandering American badgers have occasionally turned up in Western New York and even West Virginia. So they went with the local marmot species as a stand-in. The one in Punxsutawney is called Punxsutawney Phil. There is already a livestream set up for his prediction this morning. In Montana, a yellow-bellied marmot named Bitterroot Bill. 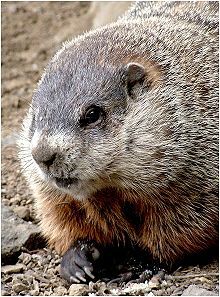 He’s not exactly the ground of Pennsylvania, but if the groundhog of Pennsylvania is a stand-in for a badger or hedgehog, shouldn’t a yellow-bellied marmot do just as well? At least Van Island Violet, an endangered Vancouver marmot, will be left alone to sleep through her hibernation. Canadians, at least on the West Coast, are nicer to their local marmot than most of us are. Indeed, this is about the only day that groundhogs get any truck with people in my area. Groundhogs are agricultural pests, and during the hot days of summer, they are frequently used as target practice by those hunters with itchy trigger fingers or those who are starting to doubt their marksmanship skills. But if you ever see the Candlemas rodents when they are roused from their winter naps, they are quite grouchy. That’s why the handlers have to wear such thick gloves. I’ve never hibernated, but I can imagine that being roused from such a state is pretty traumatic. One is that I can’t imagine the groundhog is looking for its shadow when it’s hauled out into the light. I don’t even know that groundhogs even know what shadows are. The main thing these animals seem to be caring about is why they can’t be put back to bed. The second is that, um, if an animal sees its shadow, that means the sun is out. If the sun is out, then that will melt the snow, and I would think that the sun shining would be a sign that winter is on its way out. I suppose I’m thinking this stuff out too much. It is, after all, just a regional folk custom that went viral long ago. Most people don’t even know that today is Candlemas, because it’s not an Anglo-Protestant holiday at all. In North America, it is Marmot Day. The national news will let us know what ol’ Phil saw. Of course, he won’t be interviewed. There will just a proclamation read, and the news will report on his prediction. The local news affiliates across the country will report on the local marmots, and we will go on our merry way. And then the real meteorologists will produce their forecasts. People will follow those a lot more closely than the rodent predictions. And we’ll go back to our lives. The marmots will go back to sleep. When the grounhogs arise in spring, the guns will go off as soon as the find the vegetable patch. But for one day, they are feted, even if they are too grouchy and dazed to realize it.